Most cichlids fish originating from the Lake Victoria Basin are aggressive towards one another often engaging in duel that results in death. Males often spar against each other battling over a certain territory and it is a tricky business trying to mix and match the fish to live together in a community tank. Haplochromis forms a large group or collection of species sharing certain traits. Those looking for new pet fish to graze their aquarium tank should consider the red chest cichlids because of its well mix of coloration that resembles the rainbow. This type of fish is rarely seen sold in aquarium stores and as far as I know, specimens bred in home aquariums are those captured in the wild and shipped to other parts of the world. 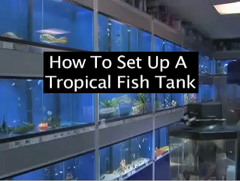 Aquarium Setup: As with normal cichlids, the red chest also require large open area to propagate and an aquarium size anything below 50 gallon is considered unsuitable. The fish can grow up to 5 inches in length and normally the aquarium setup consists of tiny grains of sand covering the bottom base. Aquarist should also consider building artificial caves so that the fish can establish its territory and can be used as a spawning site. Species Compatibility: Haplochromis is known to attack any fish that it encounters and that includes even its own kind. It will even pick on fish twice larger its size and thus, it is best kept confined to its own tank. Diet: Haplochromis is a carnivorous variety. They prefer a diet consisting of feeder fish, shrimps and other invertebrates. Frozen blood worms can also be offered to the fish but make sure you obtain the supply from clean water source or you risk introducing unwanted disease that will end up harming your pet. Breeding: Breeding in captivity is quite difficult because the male can sometimes turn aggressive attacking and injuring the female if it was deemed unworthy to become its partner. In the wild the fish is a mouthbrooder and spawning usually involves the male fish leading and coaxing the female into its territory. After successful spawn, the aquarist should make an effort to separate the female to another tank so that she can raise her young. During this period, supply of brine shrimp is compulsory so that the fry can attain proper growth.